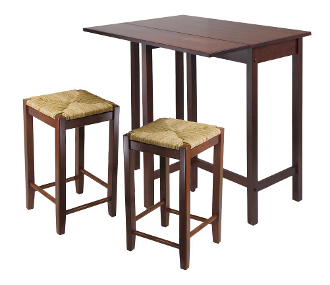 This versatile high table is space saving and functional. A leaf is folded down for space saving and when in use lift up the leaf for an extension of top surface. Top table area when leaf is up 39.37"W x 30"D x 35.43"H. Table when leaf is folded 39.37"W x 20.70"D x 35.43"H. Drop leaf 39.37"W x 10.31"D. Constructed in solid wood in warm Antique Walnut Finish. Ready to Assemble. Open size 39.4"W x 30"D x 35.4"H; Folded size 39.34"W x 20.7"D x 35.4"H; Drop leaf 39.4"W x 10.3"D.